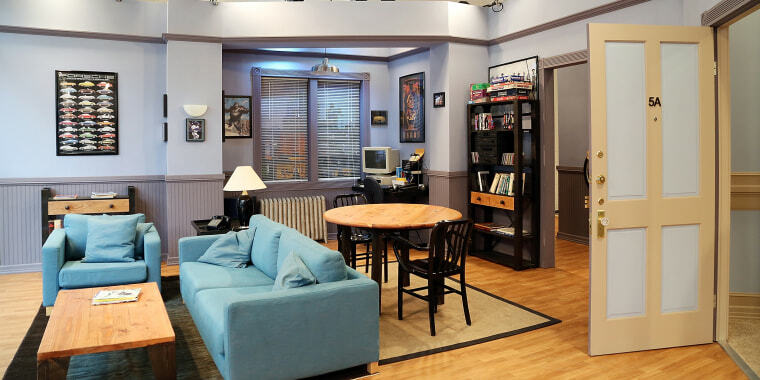 See what Jerry's apartment in "Seinfeld" would look like if the characters were to decorate it today. "Seinfeld" premiered 29 years ago this week, and even though new episodes of the series aren't on the air anymore, we like to think the characters are still hanging out in Jerry’s apartment every day. The old couch has been replaced with a no-frills neutral sofa from CB2, accompanied by a mid century-style upholstered arm chair. The wooden coffee table has been replaced with a sleek glass top from Crate & Barrel. “His furniture sports straight lines and right angles, and keeps to a palette of greys, blues and greens,” Wood said. The design also features some surprises and mementos from some of the most beloved episodes. Modsy took it one step further and imagined what would have happened if Seinfeld’s friends took over the place. The team re-decorated the apartment based on the quirky characters’ personalities. "While her original decor scheme was pretty quirky, a bit sloppy and all over the place, we thought Elaine would have matured and would have brought a more refined touch to her 2018 apartment," Wood said. Her new space would probably be a bit rustic modern now, with splashes of colors and eclectic items. The Modsy team added some fun touches from the show, including a signed Soup Nazi photograph, JujyFruits and Puddy’s Magic 8 ball jacket hanging on her coat rack. If George took over the place, Wood predicted he'd probably have a design-savvy girlfriend (or an interior designer he hired to impress a girlfriend) help. "His style is what Modsy calls 'inviting industrial' and consists of comfortable pieces with minimal and masculine accents," she explained. George’s favorite piece? "Aside from his self-portrait, we think he would have loved the drafting table (to look at, not to use of course)." And if kooky Kramer would have moved in, the apartment would be "weird and wild," Wood said. "His style is what Modsy calls 'rustic traveler' gone wild and was largely inspired by the tropical patterns and colors of the Hawaiian shirts he often wore during the series." The team imagined him picking up most of his home decor from thrift stores or giveaways on the side of the road and included a box of his favorite cigars on the coffee table. Wood estimated that the Upper West Side apartment would cost about $2,700 today — about $1,200 more than she thinks it cost in the late '80s and early '90s when the show was on the air. “The actual real-life building was located in a nice neighborhood and despite the limited closet space, ground floor level location and having Kramer as a neighbor, the layout was optimal for relaxing and entertaining friends and dates,” she said. See more renderings of the updated apartment and create your own virtual dream home at Modsy.